AmmaEpitome of pure love and humility. Prema BhaktiThe highest form of devotion!!! Amma's BooksHeart melting Prema !!! Articles & EssaysGet inspired !!! Spiritual Q&AOh Noble Souls, Awake !! All feelings should be directed to God. This will bestow good fruits. This feelings alone liberate one from the cycle of birth & death. Long Life to my Dear Lord !!! Will you help me ... ? Who gave Your beautiful form ??? When I call you ... Kanha !!! To say Your name once! Oh, Nectar of Life Divine! His name makes me jubilant. 1. 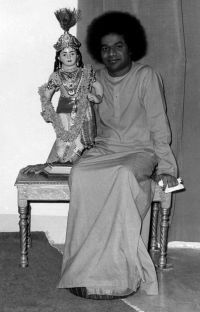 Swami returns in the Sathya Sai form. 2. Amma is Swami's Shakthi. 3. Amma's body merges as a jyothi with Swami. 4. The coming of the Sathya Yuga, the Golden Age and Prema Sai happens. 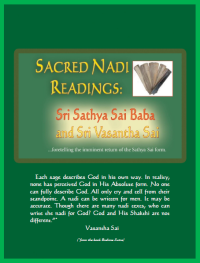 Prema Vahini is the monthly e-Newsletter (PDF) from Mukthi Nilayam. It will be released on the 23rd of every month through this website. Copyright © 2019 vasanthasai.org. All Rights Reserved.